The Australian Women in Resources Alliance (AWRA) is an industry-led initiative dedicated to helping employers attract, retain and reap the rewards of women in resources workplaces. AWRA is jointly funded by the Australian Government through the National Resource Sector Workforce Strategy and the resource industry employer group AMMA, with leadership from industry bodies and employers across Australia. The AWRA Program is delivering a range of projects to inform and support employers and one of those programs is the AWRA Recognised Program™ which recognises AMMA industry members as a Preferred Employer of Women against a assessment using my Diversity Program Review Framework™ as a basis. To be able to utilise an AWRA stamp, organisations must undergo an assessment of their workplace policies, procedures and, most importantly practices, to assess the organisation’s capability maturity against best practice management of workplace (gender) diversity. The assessment to become AWRA Recognised™ is based on a rigorous and recognised model of diversity capability, and goes beyond traditional “HR-centric” metrics to assess more broad business dimensions with clear links to organisational profitability and sustainability. The assessment outcome provides concise feedback on an organisation’s current diversity strategy, and together with the capability maturity model, helps organisations to plan the changes necessary to reap the rewards of a gender diverse workforce whilst taking into account the different stages of the organisations journey toward best practice. The Diversity Program Review Framework™ that underpins the AWRA Recognised Program™ allows us to baseline gender diversity program’s for future monitoring and reporting against the WGEA gender indicators. I am very pleased to have this opportunity to complete a ‘slim version’ of the overarching framework as part of the AWRA Recognised Program™. The data collected from resultant assessments will form a rich source of research data for my overarching research project. How do you know your organisation is working to its full potential? When I had my previous consulting company, I thought that it was part of my role as a business owner to ensure that I managed that company to the best of my ability, to make it run as efficiently as possible and for it to be as good as it could be, and I think to a large degree I achieved that aim. It was a great place to work, we had great systems that helped us to do our work and at the same time be transparent to our clients about the work that we were doing for them. We had great diversity within our team. In the quest to improve business performance, many organisations turn to performance management, process re-engineering, business transformation, triple bottom line, benchmarks and the list goes on. But is there a simpler answer to all of this? I think there is and it is an approach that is both the top down, AND bottom up! That is, really seeing your organisations full potential means that it start’s and ends with your vision and the values that you embed in that vision. If you have a vision that wants to limit the type of people that work in your organisation to those that ‘fit with your culture’, or those that have a particular type of educational background, what you are likely to get it is an organisation that is the same as you are. So the full potential of your organisation is likely to reach, well, the full potential of you and those other like people on your board. Of course this could be a good thing, but how do you really know? Unless you recognise the ‘difference’ of others and enable them to input to your vision, you might never understand how your organisation can be different and what could set it apart from your competition. You are potentially missing out on harnessing the diversity of others and leveraging off totally different viewpoints. Chances are, your organization will be stacked with people that think in a similar way to your leaders, and to fit in and be a ‘team player’, to be promoted and recognised means that you need to be ‘like’ those leaders. Of course there are some notable differences because you still need to stand out enough to demonstrate that you are leader material, or that you have a good idea. I would suggest that very often this happens in a safe, conservative and standard business type environment and if you are excelling based on tried and tested attributes and behaviours that are acceptable in your organisation – you will still be acting out ‘like’ others expect you too. Have you ever noticed that your meetings have the same topics of discussion year after year, to the point where you could virtually write up a good account of the minutes before the meeting has started? Or how often do you see a problem resolved in an organisation only to become a problem again in a few short years? I would suggest this has a lot to do with the values of the organisastion. Is your company described as a ‘dynamic player in an aggressive market’? Got a turnover of CEO’s every 18 months to 2 years? If so, perhaps your organisational values are out of step with the real potential of your company. Our businesses are built on centuries of traditional structures, overlayed with processes and policies that still reflect a business model that is now way out of date with the globalisation of our changing economy. Whilst many have tried to de-structuralise and ‘flatten’ hierarchical management structures, we still seem to rely on the same old criteria for board members, CEO’s and executives and this ‘model’ filters down into our organisation at every level. Do you know that you are really using the talents of all your employees? Does your organisation reflect the community and client base it serves or is there more that you could do? Venue: Tattersall’s in the Tattersall’s Arcade, corner Queen and Creek Streets in Brisbane. Dress Code: Please remember the business dress code for Tattersall’s: Jacket and tie with ‘ladies equivalent’; no denim please. Tattersall’s does enforce this dress code. Research Project Status Update October 2012 – “The profit impact of organisational gender Diversity programs” . Since starting this research, I have received a lot of support and interest from many people. I really appreciate the support and assistance I have received so I thought I would keep those of you that are interested updated on my progress. There are 5 phases in the research project and I am currently in Planning (Phase 1) and Identification (Phase 2) phases of the yearlong project. If you would like more information regarding the deliverables for each, please let me know. One of the most important outcomes is that I completed the academic proposal on time and received a Credit mark, thanks to the input of many of you. Your attendance at the focus groups was invaluable. That initial academic proposal underwent considerable review and rework after having feedback from a commercial organisation. You might notice that there is a slight change of name in the project title, this was suggested by one of the focus group attendees. I now have a Generic Commercial version of the proposal that I use to send out to organisations when required in order to secure funding or other means of support for the research. This is a fully costed version, including the updated literature review. As part of Phase 2, I am working on the Diversity Program Review Framework and expect to have this completed in the next two weeks. This is an important part of the research, as it will allow me to look at the viability of in-flight diversity programs and provides an assessment framework to evaluate the extent and completeness of an organisations data. This framework will allow the research team to look at potential linkage areas and get a feel for the effectiveness of Gender Diversity Programs by using a combination of survey instruments and program review techniques. It will also provide an impartial assessment to organisations that have in-flight Gender Diversity Programs. I have created a Group on LinkedIn called Gender Economics where we can discuss the broader research concepts. I have also created a sub group called Diversity Economics where I will be reporting some of the outcomes of the research as they come to hand. I do hope you will join one of these groups, follow the progress of the research and join the discussion. You also find additional information about Gender Economics at www.gendereconomics.com . I will be scheduling a Focus Group around the end of November to present the Diversity Review Framework for comments, so please let me know if you would be interested in attending. Thank you again for your support, your assistance, your interest and your well wishes. To prove a link to organisational profitability as a starting point to further study into the impact of gender on economies, i.e. : Gender Economics. This proposal is the first part of a wider study to test the theory and viability of further research into Gender Economics and Diversity Economics by first establishing a link between Gender Diversity programs and organisational profitability. Gender Economics is an emerging field of study that builds on the theories of diversity and promotes the value of gender balance, particularly in the area of innovation and creativity. It recognises the ‘direct input’ of women to the economy and extends the theory that the discipline of economics ”could be improved by freeing itself from masculine biases” (Ferber, Nelson 1993: 24). Diversity Economics focuses on the organisational economics of diversity programs and follows the concepts of Economic Diversity, ”as a way to achieve economic stability” (Wagner 1993) . The second part of the study, will take the established link between Diversity Economics and profitability further to develop quantified economic models proving the case for Gender Economics using a cost benefit analysis. Many forward thinking organisations are undertaking Diversity programs in a bid to attract and retain the right people and they must harvest a diverse talent pool to stay competitive. This talent pool includes women, ethnic groups, Gen Y and Gen X and the instigation of programs to tap into talent in the aging population. This study will focus directly on Gender Diversity Programs, which create an organisational culture where gender inequalities are minimized. Apart from estimated gains in productivity and profitability linked to an increase in gender balance, few empirically tested metrics currently exist to prove the success of these programs on profitability. 3) A greater pool of skilled resources is accessible as a direct result of proving the effectiveness of gender diversity programs . 4) Organisations can measure the impact of program outcomes through understanding the business benefits of a diverse gender mix, as well as measuring the impact of the programs’ performance through earned value analysis. Establishing metrics and financial models to monitor the progress of gender diversity programs will help substantiate their effectiveness (or otherwise) on company profit. This study will build on current evidence to substantiate quantitative findings. Studies by the European Commission (2005), “found that only 30% of companies have systematic measurement and evaluation processes in place for their diversity initiatives”. These measure quotas, targets or program performance but do not provide a causal link to profit. PLEASE CONTACT ME TO READ THE FULL PROPOSAL. Description: Building frameworks and metrics for gender diversity programs to measure their impact on bottom line profitability. Expanding these metrics to measure the economic input of gender diversity programs. Description: A specific niche consulting, which looks at imbedding integrity and improving business performance by linking environmental responsibility, cultural sensitivity (and gender) and the development of new paradigms for business management. An example of this is developing new criteria for woman in leadership roles such as Board postings so that they don’t need to fit within the old male patriarchal structures that now exist. This will allow organisations that are Integrity Ready (trademark Susanne Moore 2000-2011) to tap into so far un-recognised “female” thinking attributes for business management. Description: Project management can be affected by the quality of the project manager’s organisation and their management. The integrity of the organisation and its competency affect both project outcomes and the team members involved. Traditional methods of management can incorporate a number of negative influences and one of these is the ‘Boys Club’ mentality and it will have an impact on management decisions. Description: Harness and embrace gender diversity in your organization. Discover ways to shift the traditional paradigms of business and explore positive strategies to attract the best resources. If your organization wants to employ and retain talented women and promote female leadership then Changing Women is for you. Thanks so much to Tom Bright from Practicus who kindly responded to my earlier request for a room via LinkedIn to host my focus group in July for the first part of my research into Gender and Diversity Economics. Maybe he IS the Last Tycoon? I guess that I should feel sorry for Rupert Murdoch and his News Corp group executives as he wades through the News of the World muck, but I just don’t. There is a saying that I know so well and it is – “that everything comes to those who wait”. I love that saying and over the years I have seen it to come true again and again and again, and here we are again. The world is changing. We are starting to see many of the old empires and business practices crumble before our very eyes, and it is sure is time! Here in Australia it was FAI and then OneTel and more recently the Storm Financial Group, that crumbled and fell taking many an executive with along in the mire. Some of these businesses were built on the old business formula for success. They rewarded greed in the name of improving the “bottom line profit” and “increasing shareholder value” and for a small number of people this formula worked like the Executive’s who “couldn’t remember” saying this or that, or doing this deal or that deal. How the mighty men fall – and yes, I say men because it usually is men. At least in the case of News of the World we see a women going down along side the men of power. These companies that are built out of greed come and go but leave a legacy behind them of many distressed employee’s, shareholders and customers in their wake. Murdoch can’t distance himself from this current mess. To say that he was not ultimately responsible is just laughable. Sure he has a huge empire and yes it would be hard to manage something that big and keep you finger on the pulse. Sure it would be difficult to always be aware of what everyone in your organisation is up to, knowing how they are behaving, and understanding how your mandates for the business are being implemented, but the rot always starts at the top. The recently exposed behaviour of News of the World journalists does not suprise me at all. When you have that much global media power, the buzz of power must rub off on employee’s, and for some there is no limit to the lengths that they will go to in order to get that story or to achieve a level of power, money and position that is seen as being “the best of the best” – if that is what you want. Sadly this is still the business behaviour that is rewarded. Even in smaller organisations you often see agorant sales people being rewarded because they bring the “business” and of course “the business” and the “big deals” are needed to keep the wheels turning and to keep everyone in the organisation in a job. But we often don’t see the supporters rewarded – yet they also keep the wheels turning. This imbalance naturally causes behaviours that can lead to the kind of mess that News Corp is in, because supporter is boring but the out there, all singing all dancing, glamourous money makers are king. Ruthlessness is rewarded and in the case of Rupert Murdoch – it is admired, respected and something to be aspired to. I have come across many an aggorant employee of a large (usually American) organisation here in little old Australia, where they use the might of their companies global presence to cojole, intimidate or impede the natural progression of business. At times, even threatening their own customers if they don’t do it their way. Sure, they may not call them threats, but ultimatiums are serious when it can effect your business and must be taken seriously, especially if you are on the wrong end of the threat. Price wars are one thing, but aggorance and intimidation are another. Having owned my own consulting company where I regulary came up against Tier 1 consulting companies, I know the games that are played. The power struggles, the joistling for prime position. It is the main reason that I wrote the Integrity Management Methodology all those years ago in 1997, (copyright Susanne Moore 1997) highlighting some of this behaviour and to craft methods to combat them in the workplace, specifically around outsourcing in an ICT environment. If Rupert Murdoch truely doesn’t condone the behaviour of people like Rebekah Brooks as his representative at the helm of News International then he could have put in place methods to combat such behaviour. Sorry, saying that he was let down by the people he trusted is interesting, but just doesn’t work for me. Brooks, Murdoch Senior and his son, James Murdoch all looked pretty chummy and happy with themselves on our television sets only a week or so ago – but since Brooks’ arrest are probably not so smug and happy now…. Sadly, the aggorance of an organisation like Brooks and News of the World must come from the top. I have never met Rupert Murdoch so I can’t comment from any real experience, but just seeing him on the television over the years has not enarmoured me to his style. Over the years I have worked with some of his ex employee’s and it has been enough to have given me some taste of what the culture must be like. Many of the News Corp executives that I have met have been smug, agorant and at times chidish, some boarding on emotionless. The mere fact that Murdoch continued to forge ahead relentlessly increasing his media footprint globally in order to dominate what we see and when and if we see it, is enough for me to know that this is not a person interested in the rest of us. I understand that shareholders are important, sure I do – but what is the cost of his empire building? We already knew that a serious outcome was the potential filtering of the real news, but there must be more examples of News using their global power to influence outcomes that they shouldn’t have influence over. It is only a matter of time before these examples come out as more and more people will speak out as the prospect of retribution is removed. Interesting that Murdoch senior is said to have been “humbled” to have to explain his companies conduct to MP’s at the British parliamentary committee in London on July 19, 2011. I have no doubt that there would be many an employee of Murdoch’s who has been humbled or worse in front of Murdoch in the past. If the worst thing that he felt was humility, then that is a good thing – better than feeling humiliated like many of the phone hacking victims and their families must have been feeling. I can accept the Murdoch’s apologies, but I would like to see what action they are going to take to really stop this rot that has grown rampant in News Corp. A few sackings and a rehash of positions won’t satisfy me – nor will the closure of News Corp News of the World business. It could be a closure that saves them money, so maybe not so bad for them at all, not good for the employee’s though. What real action will be taken? Even a new CEO won’t fix the systemic problems that there must be unless a whole new value system is introduced into the organisation with those who don’t subscribe moved on. In Integrity Management – real integrity in business is more than just words and glamours speak. More than flash men walking around in expensive suits playing the old business game. 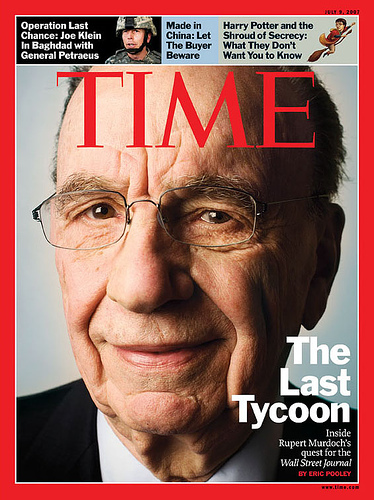 Interesting that the Time Magazine cover pictured, says of Murdoch “The last Tycoon” – maybe this is the time for a change. A change to the old style of business to make way for the new business paradims. In order to introduce real change and real integrity into an organisation like News Corp, you need to back up the words with real action, and then back up the action by implementing real ways of actioning those actions in your organisation. What do I mean? Well simply I mean that you a company makes a statement like “we care about our clients” – then a simple Integrity Management measure would be to implement methods in your business that actually listens to your clients. I don’t mean customer surveys, I mean implementing systems that allow clients to be listened to, like having systems that respect the client and not just treat them like a commodity or a nusiance. For Murdoch and all the press media things have changed. There are now thousands of people like me writing their little blogs and speaking their mind on all sorts of subjects. We are not afraid of losing our job as a journalist for not toeing the company line, because we are not controlled by anyone – we are out here in web world and we are harder to stop. The most fascinating change is that if you build your organisation on the same old models of business that News Corp has done, then you have really built a house of cards and once the first scandel has been uncovered there are generally more and then more and more and more as people come out of the wood work to uncover the mess that was once just bubbling under the surface. Once the fear has been removed real change occurs and this is what I think we are seeing happen. It is also happening with governments around the world where whole countries are on the verge of collapse. It is because we are still using the old business models and models of success to advance, but they no longer work because the world has changed. More people have a voice, more people are equal than ever before and people can’t be silenced by the old business paradigm anymore. The mightly men will continue to fall until they realise that the game is up and they start change the way that they are doing business. So in a way, I think that Rupert Murdoch has actually done the rest of us a great service by creating something that when uncovered, creates such havoc that change will have to happen!